Ethnography as a hobby or habit. The day off. With comrades, significantly not anthropologists, I visited the 2012 London Mela with this in mind: to make clear a parochial orientation, as comparative diasporic-settler dispensation, that conviviality and cosmopolitanism were not only buzz words, but also not much put into everyday political context. The Mela in Gunnersbury Park looks just like the Mela films I’ve described [forthcoming book]. I half expect a storm to rise up, the weather in so-called British summer is so unpredictable. The initial interactions we have are screen-time-esque, we pose for a selfie, someone is shooting video for Asianet or similar, vox pops on why we are here before we even get past the entrance gate. If it is also a media event inside it is also at least a welcome escape from wall-to-wall screen time, a temporary respite from media under the trees where the carcinogens and drones cannot so easily reach, and Wi-Fi options are rubbish. Phones in our pockets though, and texting to find each other when lost in the crowd works with a delay, perhaps because of the crowds, or the cops. The world in microcosm already begins to replicate the exotic locations of non-resident and diasporic masala drama. We meet with friends and join conversations on the events of the day, we set about setting the world to rights, as Mrinal Sen once told me was the point of adda (personal communication 1998). There are a number of Melas held throughout the UK in summer – Nottingham, Leicester, Bradford are regulars – and researching South Asian musics made this too part of that amorphous festive research non-category then in its sonic register in the North of England. Anticipating relaxation and conversation, but also some stage action, as well as decent food, sunshine – it is London in summer, I am still wary – and carnival rides, we seek out the sensibility of diasporic South Asias in this idea of conviviality, the social reproduction of support and solidarity. Under austerity this is also strained and increasingly threatened, as ever, but still it can be identified. The idea of community as manifest in Gunnersbury Park, in the family groups welcoming relatives, children, friends and comrades in convivial festive embrace is the take-home experience of Mela. At Gunnersbury Park there is the chance of taking an angular, or should it be greater, more expansive, interpretive perspective over the everyday routines that leave convention untouched. Mundane and routine and full of problems it may be, but life and food and music and weather are more nuanced than all your concepts and theories. Isn’t it important to think about these things more than the conceptual egotism of non-referential writing for impact, awards or self-advancement. This year the Ferris wheel is wholly commercial, but offered fun times and an atmosphere of celebration in contrast to the mood of the previous year just three weeks after London had been ‘consumed’ by riots AKA uprising after the police had killed the unarmed Mark Duggan. Other contextualising factors can be listed, but in the 2012 edition even before getting to the venue and the memory of the previous year’s uprisings, police panic and government rhetoric was on display amidst quite different feelings both before and after the Olympics event. I introduce my partner to a friend after we arrive and it turns out they both have previously lived in one of the most effected areas in 2011, the borough of Ealing was subject to ‘disorder’ on the third night of the uprising. What to say of those events? A vast number of words were spilled in the press and in research reports which tried to explain why London erupted in ‘spontaneous bouts of aggressive late night shopping’ as one government pundit glossed it on BBC’s Newsnight. A subsequent police crackdown, with emergency courts convened, and youths sent to prison for not paying for bottled water, buns, cans of drink or DVDs. Looking back from Mela to the previous August, of 2011, there are videophone images of wrongful arrest added to a vast rota of unacceptable and flagrant disregard of process on the part of the police. No surprise was expressed about this in conversation with people too often at the sharp end of stop and search interventions in present-day London. While Mela is relaxed, it is impossible to consider any community gathering without remembering the wider record of murders by Police that to date have gone unaddressed in the UK. This because of the presence of numbers of Jankel armoured police vans and busloads of riot cops waiting in the streets not far from Gunnersbury Park. A vivid reminder that multicultural celebration has a harsh reception in some sections. The cops for one, but also the well to do art crowd, the bureaucrats and managers, those who are cops in other uniforms. Exposure of Police murders in London, as documented in the film Injustice (2000 dir. Fero/Mehmood), shows that community policing, with its stop and search power and ready-response teams, is no straightforward ‘service’ – friendly cops at a carnival – but rather comes across often as aggressive and provocative threat well beyond lawful regulations. If the police have an explicit duty of care, there are far too many examples where this has broken down in ‘broken Britain’. The London Mela in 2012 was the tenth version of that event, and it was no surprise our next discussion about the Olympics served as contrast to the previous year of conflict. The Mayor of London’s ‘celebrations’ (strangely possessive mode of expression) for Eid ul Fitr had been moved to Gunnersbury Park because of the Paralympics. Boris Johnson’s sponsorship of the Eid stage at the Mela was quite some way from his celebrated – and heckled – appearance with a broom to clean up the streets in Clapham the previous year. Perception on the ground, as opposed to the media, often runs a different course. What this means is that political self-regard is a mere contrivance – the idea that Mela can suggest an alternative modality for thinking of culture, commerce and globality, a vernacular form of cultural exchange already there in the city, but countermanded by the presence of Johnson and the cops. The impact of the Olympics raised discussion of a long history of disconnect between the white Left and the militant Black and Asian anti-imperialists. One comrade railed against the ways the SWP had mismanaged Stop the War (STW), claiming leadership of the activist coalition, failing to ‘Stop’ the invasions of Afghanistan and Iraq, and presiding over a decline in numbers mobilised from the high-point of February 15th 2003, when two million people protested in London. Sectarian splits and squabbles left the organisation as a dysfunctional rump by 2007, while the wars escalated. Subsequent silence on NATO involvement in Libya was only confirmation of the ineffectual character of STW (Chandan 2015). So much so, even the suggestion that STW might ‘mobilise’ to attend the Mela and protest Johnson’s sponsorship was laughable. Sitting in the sun by the Eid stage, which was somewhat away from the commercial parts of the Mela further up the park in Gunnersbury, it was easier to enjoy a day out without the constant need to negotiate the egos of self-promoting anti-racist pseudo-Left posturing. This does not mean the day was without cost or exertion. Long queues for the food at the Moti Mahal restaurant tent, curiosity piqued at what the Rotary Association, the Red Cross or the Post Office had to offer amongst the various stallholders. Membership, health aid, and special parcel rates for the subcontinent were the obvious answers easily found. Clothing stalls sold tie-dye and kaftans from what seems like a much earlier era, and the travel company next door to the Bikram Yoga promotional stand made appropriate partners in the business of getting away from it all – the global extension and adaptation of yoga to suit varied European and North American audiences, regardless of culture, is phenomenal. Selling yoga back to South Asians as a novelty must be one of the strangest twists in the convoluted game. Wondering what people made of that. To look at London activism through the eyes of those in the British-Asian contingent, informed and critical of Islamism or Hindutva as represented in its war versions, is a necessary empathy that needs more effort. There are so many who are far more knowledgeable of the culture turned exotic and the cinema made subject of study than I can be, which means being left thinking there is still too much to learn. Yet the suggestion is readily accepted that on the one hand NATO attacks, on the other, the Olympics, might be taken as a dialectical code through which to understand ‘the two Augusts’ of festival Britain. The Olympics featured Akram Khan, Anish Kapoor and Eric Idle. The connection between the two Augusts as quite different manifestations of the ‘same’ South Asian cultural management was easy enough to put forward. One August was an uprising with slow but certain legal containment and subsequent media-managed clean up. The second August an extravaganza of merchandising, replete with invitations to well-known and unknown celebrity South Asian figures curating some of the events. The Olympic ceremony was choreographed by a master of ‘new intercultural’ dance, Akram Khan (see Mitra 2015); a twisted challenge to the Eiffel tower was offered by Anish Kapoor as ‘helter skelter’ in the form of the ArcelorMittal Orbit which stood outside the Olympic stadium in Stratford; Eric Idle provided the comic relief. Then Prime Minister David Cameron celebrated the Olympics as a triumph of British business. Uncomfortably, he had to negotiate a complex investment in attending the opening and closing ceremonies while denouncing the declining school sports programming that permits ‘Indian Dancing’ and other non-competitive formats. All the while mouthing platitudes about support for Islam as a religion of peace, while leading trade delegations to Arms Fairs to sell British weapons to despots – with Britain having the 6th highest grossing armaments industry, but the largest percentage of third world sales. Eric Idle, of the Monty Python comedy team, was perfecting his version of bhangra-style dancing at the Olympic ceremony after singing ‘Always look on the bright side of life’. It would be mean to mock another of the pensionable comedy circuit over such a feel-good expression, but contrasted with the Prime Minister’s pronouncements, this may be considered the high point of political critique in neo-liberal multi-racist Britain. Idle dancing, while Akram Khan watches on and Anish telescoping the view from the tower. How can this confluence sit except as provocation to understand Global South Asia as a zone of interpretation in a war that has two polarities – bombing and exotica? More disturbing perhaps was that the closing ceremony was a kind of expression of release and frankly unexpected comforting celebration. Surprising success in track and field accompanied by no serious logistical breakdowns, and of course no terror ‘incident’ meant the closing ceremony contrasted massively with the atmosphere before the games. The Prime Minister no doubt daydreamed of a poll uptick, on the back of a recovering economy – which was not to be, as the recession seemed locked-in via a mix of austerity policies and permanent stagnation. Citizens wore their Olympics volunteer shirts for weeks after the event, and the stain on the capital from the previous August was seemingly erased. Or at least all those subject to austerity measures were silenced, or had migrated north. Prime Minister Cameron himself felt emboldened enough to praise the games and the people of London, even at one point mentioning its diversity. No mention of the weapons programme, the medals forged by Riotinto, the payback and corporate favours that secured the event in the first place, and his palpable relief to have bumped the criticisms of austerity off the front page of the press for a while. His Brexit demise still some way off, the critique of ‘Indian dancing’ managed to signal the two poles of a demonisation and exoticist versioning of Global South Asia together even as the image was simplified in a cultural attack. All that is wrong with contemporary Britain was put right in an imaginary fantasy of a sporting pay-off from the Olympics, with school children once again competing in robust, muscular, athletic contests and effete aerobic non-sports triumphantly excised from the curriculum. Global South Asia had thereby degraded under Cameron’s misrule in favour of an image of Eric Idle pointlessly ‘dancing’ while Britain rejoiced in a victorious new dawn of escalating armaments investment and a still greater, if secret death squad proxy war on terror compliment to austerity as the permanent solution to fiscal needs. Melodrama of the worst kind, her Royal Richness, parachuting in with James Bond was the only saving grace, until the shock of recognition wore off and the multi-millions of extorted wealth in Olympic proportions reminded us that transference and projection are the vehicles of deceit. The allegorical national fantasy here is that 007 protection and a combat ready grandmother can keep the old Empire spirit alive, even if displays of the Koh-i-noor and other splendid stolen baubles are demoted to commonwealth events and shares in the mining industry, weapons trade and off-shore schemings are the real treasures of the day. In the Mela event immediately after the Olympics it was possible to dwell upon the resources expended to put on and maintain these community cohesions. The logistics of carnival do not extend as far as they do for sport in general, where infrastructural dispensation from Whitehall confers responsibility to set up subsequent decades of enhanced school sports curriculum and competitive business initiatives. The work involved at Gunnersbury Park, without as many volunteers, but still some in branded identification t-shirts, was both incredibly popular and clearly taxing. The steward responsible for the cash box seemed distracted, the cleaners behind the scenes and the coordinators of the amateur Bharatanatyam dance groups were apparently underpaid but dedicated beyond the call. Others were volunteers of a more regular variety, staff of parents’ shops, regulars on the festival circuit, still others roped-in for a one-off. Who else works to make Mela happen? The website operators, those responsible for publicity and liaison with the press, including TV crews which came down at dusk – when the light is best perhaps – and took their story with a few sound bites from the organisers. An appearance by the local councilor, and security provided for them, band security, port-a-cabin monitor – and delivery, maintenance, catering. The significant effort of community organisation members to make an event like the London Mela go off well is not a negligible contribution to annual GDP. It is often unwaged work, not seen or remunerated, as if it were a freely given gift, but even here – as Marx would help us see – the contribution of all parts of the society to the society of surplus labour extraction somehow always contributes, in the end, to the reproduction of labour capacity and profit. Is it still plausible to talk of allegorical Mela if the London 2012 Olympics is presented as national-ideological and Global South Asian festival-exotica in turn? Analysis means working through the corporate-ideological in the use of the games to provide opportunities for Riotinto to forge the medals and ArcelorMittel to build the tower; the psychological-ideological category of internal revolt in the opening and closing ceremonial performances and the success of Mo Farah; and finally to contrast the threat of international terror-ideological in the surface–to-air missiles stationed very publicly in parks before the games with the affable performative-ethnographic exoticist Pythonesque rendering of the British nation as neo-Global South Asia at the end. Each of these interpretations accesses dimensions of the current corporate psycho-terror-exotic dispensation in turn. At the same time, I do not want to dismiss the critique of allegorical focus as homogenisation and must recognise the Games did function as a celebratory resolution and in fact transformation of a concerted pre-games anxiety. The weeks before the celebration and increased sensitivity to tabloid headlines on corruption and security stemming in part from the previous domestic and international year of rioting and war. The weeks after, a smug satisfaction, and continued austerity and war, with barely felt gestures such as Johnson’s sponsorship of the Eid stage and the installation of a wax figure of Madhuri Dixit at Madame Tussauds. Is it too strange then to see the Olympics as a melodramatic staging of a festival of Global South Asia – the London Eye and the Ferris wheels of Mela as the chakra in the middle of the Indian national flag, the images of diasporic London in Bollywood cinema and Gunnersbury Bagh all as part of a representation of Asia that has escaped its moorings to do cultural duty for the geopolitical intrigues of business and arms traders. 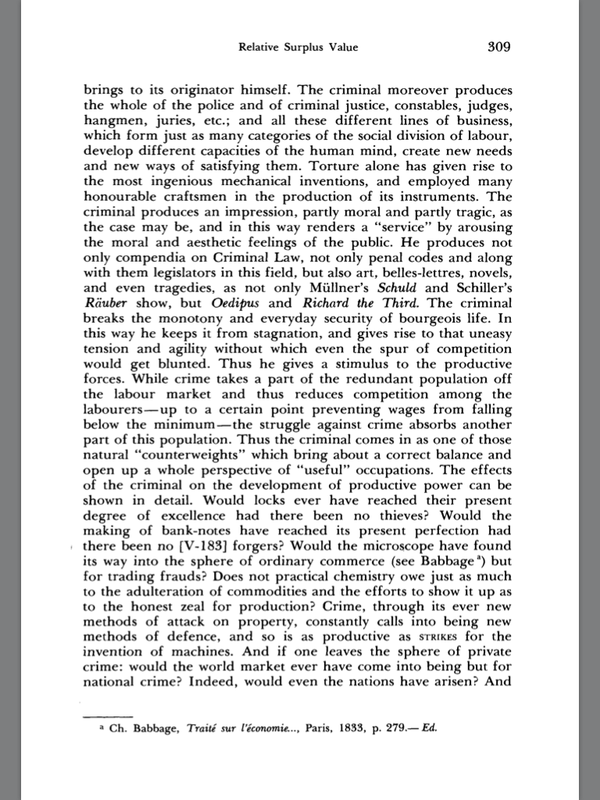 Marx on crime. And professors. The informality of ‘free’ labour. 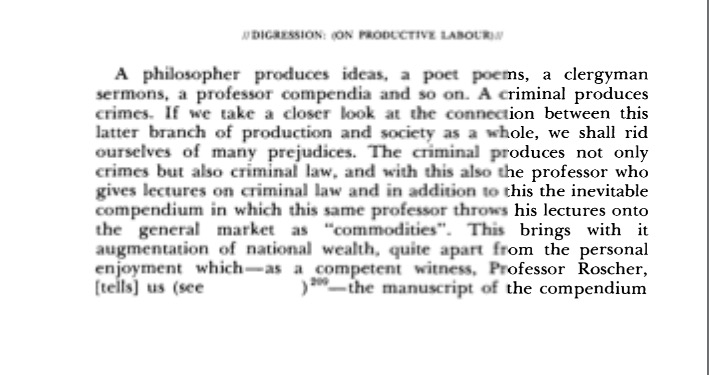 Conceptions of ‘labour’ have relied for too long on an unexamined conventional definition based upon working hours which ignores Marx’s radical and innovative extended argument in Capital. Labour, in Marx’s unfolding presentation, is first of all labour-power, but in a changing sense. His analysis proceeds from simple reproduction to collective – a movement replicated in individual chapters and in the book as a whole. By the later chapters of volume one, the issue is the maintenance of a separation between productive consumption in the workplace and consumption that reproduces collective labour power. A distinction maintained by the wage form, with responsibility for reproduction – food, shelter, training, domestic life, childrearing etc – delegated to non-work or unpaid ‘free’ time.